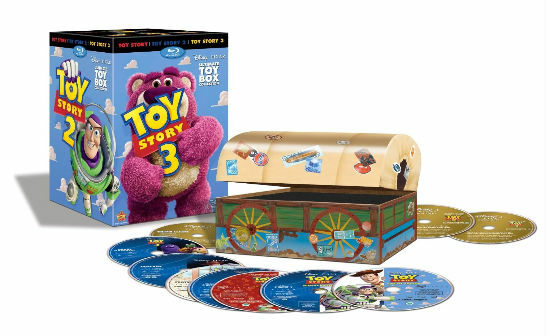 So, the details have been released for the Blu-Ray trilogy box set of the Toy Story franchise. Man, that's a mouthful. Take the time to click over and see all this baby is packed with. Perhaps it's time you pre-ordered the best trilogy of films? Yeah, I believe that. I agree..."Toy Story" is the best trilogy of films. I'm definitely pre-ordering this set. Where was Blusky when it came to breaking news about the Beauty & The Beast exclusive Best Buy bluray steelbook? Nowhere. Cute packaging. There's nothing in here that you won't get when you buy the combo packs individually, and most of us already have the first 2. Also, it looks like the disks are stacked sideways in the paper covered wagon, which is not very archival. I was hoping for a proper trilogy set with new material, but that will come in the future. This is just a fancy box with the same disks available elsewhere. Everyone should own these on Blu, but the Ultimate box is still to come. "Where was Blusky when it came to breaking news about the Beauty & The Beast exclusive Best Buy bluray"
Excuse me, I'm off to Best Buy! Goodluck. They are sold out at every Best Buy I went to. For someone who runs a blog dedicated to all things Disney, Honor, you seem remarkably uninformed. Perhaps he's just remarkably got a sense of humor? Geeez Louise, give the guy a break. He saw them, he posted. Thanks for the info, man.